I love Katsudon. The Japanese food joint where I love Katsudon the most is called Komorosoba followed by Teriyaki Boy. I was in between meetings the other day and was kinda hungry. The building cafeteria just closed and so I had to look for a nearby place to eat. My best bet was to look for my favorite convenience store 7-11, and grab a bite of their delicious steaming hotdogs. 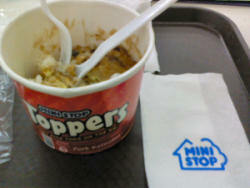 Unfortunately, the nearest convenience store which was a block away was Ministop and so I decided to check it out. To my surprise, I found a huge array of ready to eat meals which are microwave ready. The moment I saw a Katsudon meal, I bought the last one and heated it up for 3 minutes as stated in their microwave oven. I sat down at the corner table and excitedly opened the container. That was the peak of my Katsudon experience as everything else went downhill from there. The pork strips didn't taste like pork (nor meat for that matter), the rice tasted like paste and the entire experience didn't have any trace of being a Japanese meal. Nevertheless, I tried to eat it. Looking at the half-filled container, I decided to quit before I get an upset stomach. The damn thing tasted awful ! It just looks nice and packaging is appealing too. But take my word for it, I wouldn't even try the other meals. I'm sticking with the 7-11 hotdog if I get hungry again.